I had fun going to Old Navy with my daughter over the weekend. (She turned 16 on Saturday and gets her license tomorrow! Eeeek!) I had no intention of shopping for myself but in the end they had a lot of cute things that I couldn’t resist getting two things. One was this sundress. It’s loose and light and strappy. Perfect for a hot day! The back has this gathered area so it stays on nice and snug but still allowing me to breathe. I added this sailboat necklace because…nautical! Don’t you love how the print of the dress looks like water? If you need some inspiration on what to wear each day, join us during the month of June, following the clothing prompts put out by different Blended Bloggers. 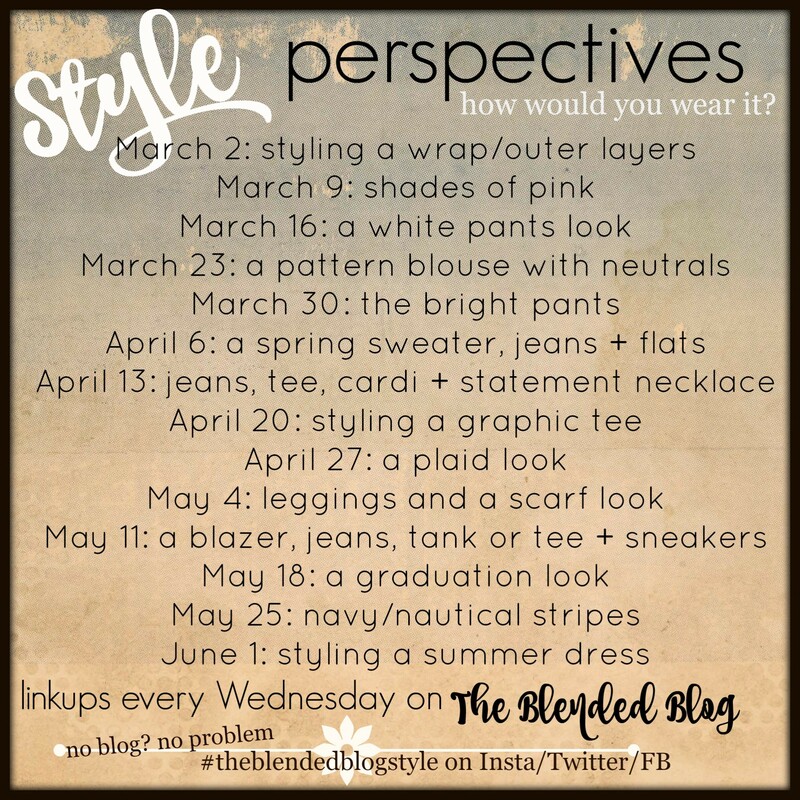 Join them on their blogs and we’ll all link up on Wednesdays on the Blended Blog. Here are the first week’s prompts. It’s nice to not to have to think too much about what to wear! I hope you’ll join us! Yes! I actually really love those glasses! It’s true, isn’t it!? I find the best stuff when not looking for it…including a husband! Lol! The best purchases always happen when you aren’t looking! A great summer dress you’ll get lots of use of this summer. Super cute dress on you! And have I told you lately how much I’m loving your new shorter do? Super cute on you. You’ll be getting a ton of wear out of this summer staple! Yay for Old Navy fit and flare dresses! Thank you for the hair compliment, Sarah! I like a shorter (easier) cut in the summer! That dress was just made for you! 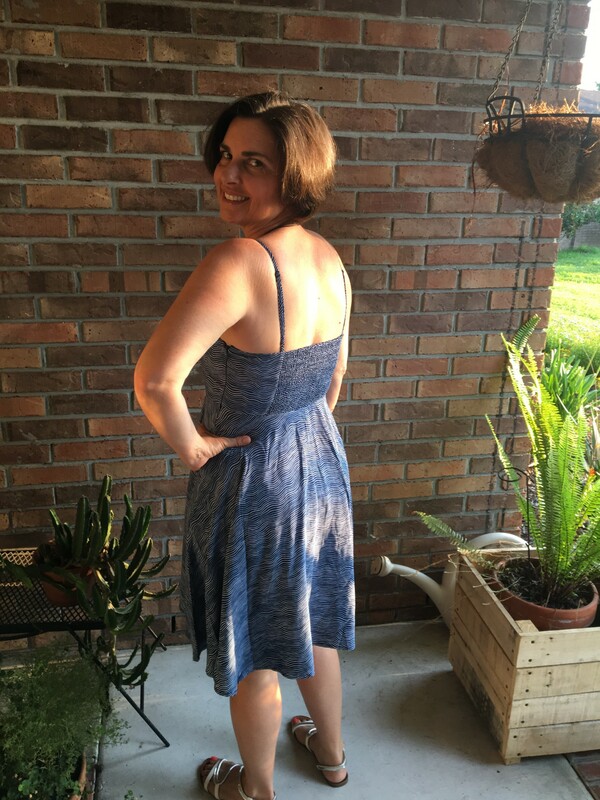 I LOVE summer dresses, and you are totally rocking this one! Hello Hot Mama!! 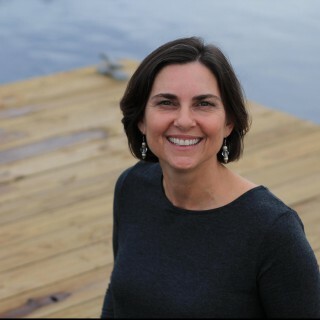 That pattern does look like water so the sailboat necklace is perfect!! You’re a true doll!! Thanks Andrea! Hope you have a fun weekend! So pretty – and very scary having a 16 year old eh? I’m terrified daily! Since she’s the third 16 yo I’ve had, it’s not so bad. I’ll miss our chats in the car though! That dress is so pretty on you, and it does look like water! 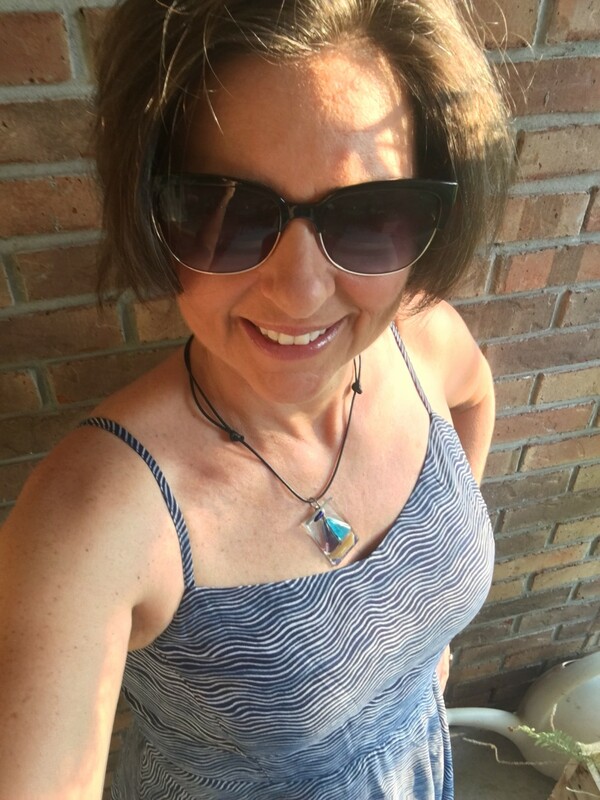 It fits you perfectly – and I love the necklace. Thanks Lana! The necklace was a gift from my hubby! Super cute dress!! I found some cute dresses there too! My daughter got a cute one too. Too bad they weren’t on sale or she would have bought a second one. Agreed! Perfect dress for a hot day. It does have a little water vibe to it. Good choice! Cute dress! Finding a great piece of clothing when you are not looking for it is the best! Yes, exactly, Andrea! I often find things when I’m not looking for them! those sunglasses look GREAT on you!!!! Also, that dress is super cute, I love things with stretch!! lol (I’ll thank my children for that one). Yes, the stretchy part makes it fit well without squeezing too much! Very good for kids too! You are right! That pattern in the dress is so watery-wavy looking. Perfect for summer. Great fit on your dress, so flattering – you look tiny and fit and I love the way the bodice fits – your straps are staying up, love the smocking or gathering in the back. You should make this your uniform. You look about 25! 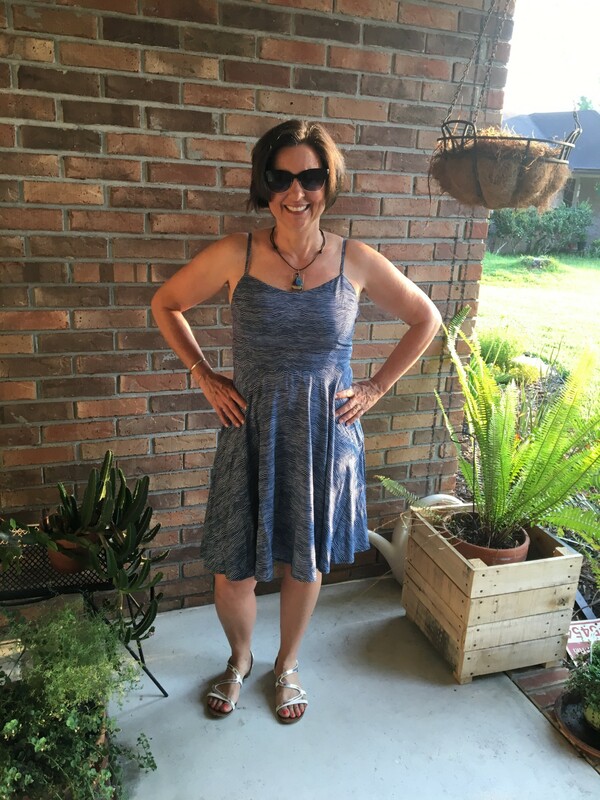 I love a fit and flare dress on me! Much more flattering (and forgiving!) than other styles! I’m not feeling very fit these days but sometimes you gotta fake it til you feel it, right? You look so cute and summery in your dress. Old Navy has the best summer dresses. I picked up a couple last year and a few more this year. The only thing – I hope these new ones wash better than the ones from last year, which shrunk! Noo!! I sure hope they don’t shrink! I always wash in cold water and I don’t dry this type of material! If it does, I’m taking it back! It has no room for shrinkage! Thanks for the head’s up! I absolutely adore that Old Navy dress, Sheila! So fun that your daughter turned 16! Happy birthday to her but scary that she’s driving I’m sure for you! Btw, love your blog!! What is it about Old Navy dresses that just seem to jump into carts? I swear I go in there for something specific (like workout shorts) and I still walk out with a new dress or skirt. This one looks great on you! The patterns, the fit, the prices all conspire to make them jump in MY carts!